Hi! About two weeks have past since our last blog post. If you are interested in what we have done, what our plans are and when you can try out the latest prototype, please continue reading. Since the last blog post we have look at how much we can do with the game within our time frame. Since we are students, in a couple of weeks we will have new courses that will allocate a lot of our time, which means we will not have enough time to work on the game. Therefore we decided to not add any new features into the prototype for now. Instead we have focused to polish the features we have and make the game as playable as possible. Our goal is to give you, the player, a sense of what the game could be like if we were to, at some point, continue production and make it a finished product. Our current plan is to release the last prototype for this production period late next week. We will also send out feedback forms, as we have done previously. With the feedback, we hope to be able to see if continuing production of the game is something that the community wants. So if you want this to be continued upon, please remember to tell us! So, what can you expect from the upcoming prototype? You will be stranded on a raft in the middle of the ocean. In order to survive you must first of all take care of your hunger and thirst! By scavenging debris floating past in the water, you can craft equipment to fish, cook, purify water and grow vegetables. When the hunger and thirst is quenched, you can start expanding your raft in order to build a more long term establishment for you to live in. After all, you never know when you will see land again, might as well make the journey more comfortable. When more space is available, you can build nets to automatically collect debris, plant trees which can be cut down for material and expand your crops in order to make hunger less of a problem. Although, hunger and thirst are not the only dangers out on the ocean. Sharks are lurking in the waters, trying to get to you by destroying your raft. The shark, which attacks and can be killed for food. Big crop plot, where you can plant a tree. Barrels that float by, which can contain various items. 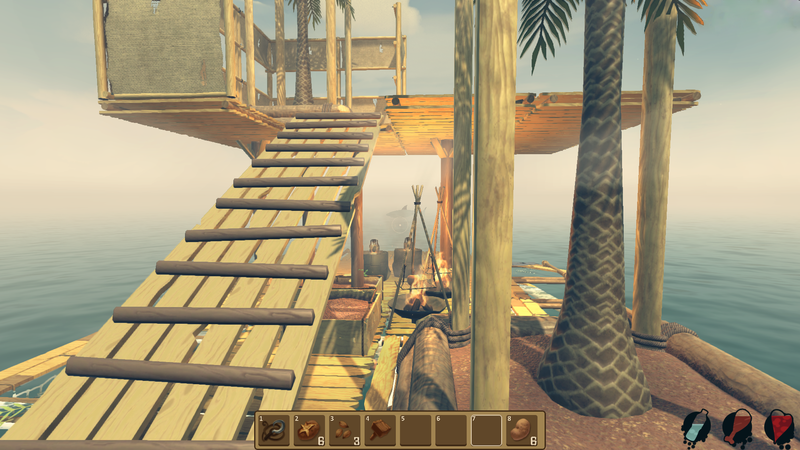 Several graphic improvements, such as fog, new water shader, image effects and more. Several textures and model placeholders replaced. A bunch of bugs fixed. We hope you look forward to the new prototype! If you want to be sure to know when it is available, you can follow us on Facebook, Twitter or Instagram, or you can sign up for our Newsletter!